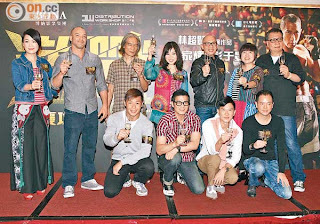 The Nick Cheung Ka Fai starred new film UNBEATABLE (GIK JIN) broke HK$10 million at the box office after five days, defeating THE GRANDMASTERS (YUT DOI JUNG SI), JOURNEY TO THE WEST CONQUERING THE DEMON (SAI YAU GONG MOR PIN) and others to be this year's opening box office champion. Cheung Ka Fai and director Dante Lam Chiu Yin, Au Kam Tong, Chan Ka Fai and Vivien Leung Siu Bing two nights ago attended the celebration. Ka Fai said, "YOU ARE THE APPLE OF MY EYE became the Hong Kong Chinese film box office champion, which I would treat as my goal!" Ka Fai admitted that before release he had no way of estimating the box office. Later he learned that the two day advanced screenings made over HK$2 million and after the official release it made over HK$2 million daily. He was both excited and nervous, as it was the best box office he had over the years. Some film critics predicted that UNBEATABLE will sweep all award shows like A SIMPLE LIFE (TOH JEH) did. Did Ka Fai feel any pressure? He said, "Awards are hard to predict. Different judging regions have different sights and rules." He said that as long as viewers liked this film he was already satisfied. Speaking of his depression rumor, Ka Fai joked, "I am so happy I don't know what to do, such a good performance! The magazine said that I slept in a separate room, I was very curious and immediately wanted to see if I walked around at home in my underwear and took a shower in the bathroom the magazine would know too. They knew that I was sleeping in a separate bedroom? How did they know? I just read it like a joke, my wife also just laughed it off." As for mood problems, he revealed that Lam Chiu Yin was the working partner who he was the most comfortable with. Although their past collaborations were very dark, they were full of chemistry. When he took his mark he had no pressure. From BEAST STALKER (JING YUN), STOOL PIGEON (SIN YUN) to UNBEATABLE he never felt uncomfortable. He revealed that Lam Chiu Yin once half jokingly said that the film will apply for the Oscar Best Foreign Film nomination. Ka Fai hoped to have another celebration. Will he show off his muscles at another celebration? He said, "Eddie has been keeping up, I haven't. Tell him to streak, I will run along and help with crowd control. At most I would dance with (Michelle) Lo Mik Shuet." Ka Fai revealed that earlier he and his wife Esther Kwan Wing Ho went to see UNBEATABLE in disguises. His wife shed tears earlier than expected. "I also heard a girl saw my big guy appeared and whispered to her boyfriend, 'Ka Fai went mad, outrageous, too powerful!' She also dare not watch my fight scenes. I like watching these audience reactions very much, so in the future I will still secretly go to the movies to watch audience response." He even urged viewers to watch the end of the film before leaving, because after the end credit was photos of characters' lives afterward. However he denied that they set up for a sequel.